Don't I wish I could afford one of these reproductions from LeLuxe! Help! Which re-fashion would you go with? 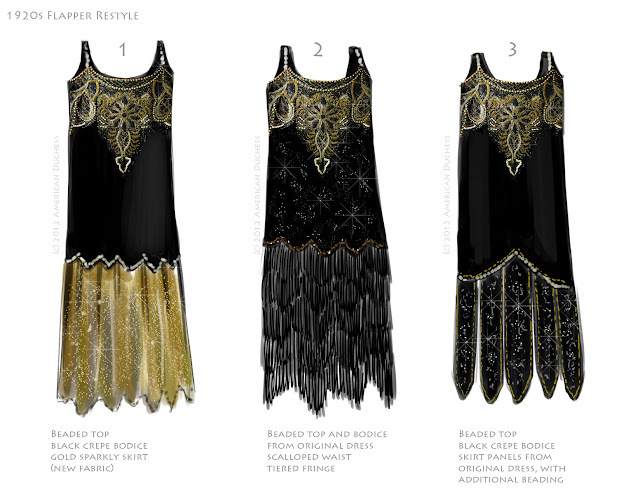 I would go with number two or three, just because I think you don't see enough beading on 1920s costumes in general. Three would have a good balance of beading above and below. Yes! I thought Midnight in Paris did a really good job with having heavily beaded evening dresses, I thought. I have to say it...I LOVE #2...but #3 is also very nice. I love fringe, and it is so part of the 20s. Good luck on deciding what you want to do! I love the paneled skirt - #3! I think it will do a good job with seeing more beading, too. I have to agree. Chainette fringe, if done right (as in your example photo) is okay, but is usually overdone as a choice for many 20s costumes. It kind of screams: "I couldn't afford a proper beaded dress, and my pattern came from the pattern books at the fabric store, and I'm doing a musical of Guys and Dolls at my local community theater." Your mileage may, of course, vary. I think I like #1 the best, #2 is nice too, especially with the sparkly beaded fabric on the top. The curvy waist thing on #3 looks a bit odd but I like the panels. Love the 3 - spot on for period, good use of recycled fabric which means you can splurge on beads and all that handwork will really personalize. On the downside, it is not as fast as the others. End of march is really quite close. If you have to go for one of the others for speed then I like 2. I take your point about cliche, and raise you an Iconic. Even the mundanes will recognise your 20's verve. Don't like 1 at all. I love 3! Number 1 is good too, but I'm just not a fan of fringe. They're all pretty but I would go with number two! If you are dancing go with the fringe! #2 would look best if you incorporated gold/silver into the lower two-thirds of the dress. Having the color just at the top makes it look out of place and too heavy. The period beaded gowns I've handled incorporate the beading over the entire gown, and if there's more than one color, it is used throughout. Tough call! So far, #3 is in the lead, but not by much. I do like the paneling on it, although it will require more hand work. ... time to go shopping! I love #3...it will move as you move, not hang there like a curtain! I've done costume pieces with this kind of skirt and they turn out really well, although mine were not fancy, nor beaded. Be sure to let us see what you do! The fringe would work so long as you don't use cheap stuff, do layer it close together, and do the scallops/zig-zags. Cheap fringe widely spaced in straight lines is what looks like Halloween. That said, #1 is my favorite. I'm imagining the skirt from the Callot Soeurs dress on that version. Fringe on a flapper-dress has become such a cliche, please do *anything* else. I respectfully suggest you consider a "robe de style", it's a wonderful 20's fashion that is sadly ignored these days. Putting in my vote for number 3! I'd go with your third option, definitely. The beaded skirt tabs scream flapper, but they're less typical than fringe. Sharon's Robe de Style idea is spectacular! They're such a unique 20s style, and there were so many ways to create the panniers and use them in the design. Superb dresses shared here. I like all of them. All are of latest fashion and very comfortable. I am highly obliged to be here by getting it.